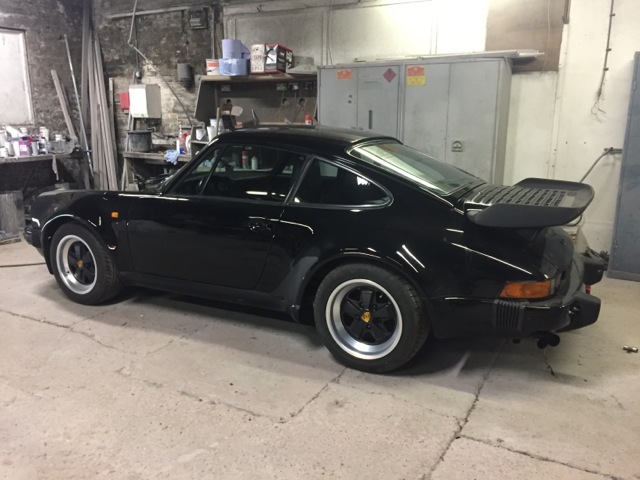 An exemplary 930 Porsche Turbo in the highly sought after colour combination of black with black interior. It is not currently registered in the UK, but has all the necessary paperwork to register it either in the UK or in Europe. It also comes with a letter from the Porsche Club UK confirming its VIN number and the Certificate of Authenticity, which confirms all numbers and specification for the car. Overall, the car runs and drives very well, with just a few, small jobs for it to be complete; fitting some trim (trunk carpet and door cards), and fitting headlights and door mirrors, plus some other minor works. First registered in North America on 3rd April 1987 where it stayed until 1992. Then shipped to Fukuoka, Japan and resided there until 2009/10 when it was shipped to the UK to join a collection of cars in the South. The car was stored from 2010 in dry storage barn and was purchased by its current owner in August 2016. It has then undergone a comprehensive re commissioning project. Sits on period Fuchs 16” wheels which are fitted with new continental sport tyres. It has the original service book and owners manual!! The speedometer reads in kilometers, after being in japan. Currently showing 88,100 KM. The current owner has decided to sell as he feels he cannot commit the time to making sure this Porsche is properly appreciated. All information will be backed up in a comprehensive documents file, included in the sale. The car speaks for itself, and, at this price, won’t be around for long.